This is an eclectic collection of short stories that are supposed to take place in the Kitty Norville world. Some are better than others. A few… I’m not sure what they’re doing in this book at all. Here’s a breakdown. “A Princess of Spain” – I’m not entirely sure what this story is doing in this anthology. It’s set in England in the early 1500’s and tells the story of Catherine of Aragon’s marriage to a young Prince Arthur. The young groom is too ill to consummate the marriage and it turns out that a vampire has taken him for her pawn. It wasn’t a bad little story, it just felt out of place. “Conquistador de la Noche” – We’re still in the 1500’s here, but there actually is a Kitty connection this time. This is the story of how Ricardo de Avila became a vampire. Yes, we’re talking about Rick. He was one of Coronado’s men, exploring the new world. After 10 years, he was approached by an old friend and lured to a neighboring village. It turns out that Diego is a vampire. Ricardo found out when Diego and three of his vampire friends attacked him and changed him against his will. The other men thought that once he was turned, Ricardo would be content to kill and plunder at their sides. They were wrong. Ricardo is made of sterner stuff. And while he’ll never be human again, he won’t be the evil thing they expected him to be. “The Book of Daniel” – This story jumps back to Persia, just after the fall of Babylon. Daniel is a lion-shifter and advisor to the Persian king, Darius. Daniel is a pious man, a Hebrew. His wisdom and devotion to his faith make him a target of the other advisors. They try to have him killed by tossing him in a lion’s pit. Imagine their surprise when he walks out, unscathed, the next day. “The Temptation of Robin Green” – Robin is a Lieutenant in the military, working for the Centers for the Study of Paranatural Biology. We heard about this research facility in Kitty Goes to Washington, although in this story, there are far more outlandish creatures than we were introduced to in any of the Kitty novels. Basically, the story is about how Robin encounters a Selkie and succumbs to his charms. But what really bothered me about the whole things is the presence of Rick. Apparently, he was a prisoner there at one time… though to my recollection that has never been acknowledged in the series. (Did I forget this?) Robin frees him when she escapes with the Selkie. –And by the way, the Selkie ditches her. “Looking After Family” – Now THIS is the kind of story I had in mind for this book. It’s a little peek into the history of Cormac and Ben. It takes place right after Cormac’s father is killed and he goes to live with Ben’s family. Cormac is cut off emotionally and Ben barely recognizes his cousin. On the first full moon after he moves in, Cormac sneaks out to hunt and Ben tags along. It’s then that Ben learns about werewolves and what really killed his uncle. And it’s the beginning of that connection between Cormac and Ben that continues into the current books. “God’s Creatures” – Here we see the Cormac we met at the beginning of the series. He’s a hunter; he believes all werewolves are monsters. And he’s been hired by a rancher to track one down and kill it. Cormac discovers the creature is linked to a local Catholic girls school. I think maybe this experience is one of many that begins to show him that there are more to werewolves than just beasts. “Wild Ride” – Oh, TJ, I hardly knew you. (**sniff**) This is the story of how TJ became a werewolf. From the moment he found out he was HIV positive, to his decision to be bitten… and his eventual choice to strike out as a lone wolf. It was good, but bittersweet, in light of the events of Kitty and the Midnight Hour. “Winnowing the Herd” – This may be the shortest story in the book… just six pages. It gives us a glimpse of Kitty’s state of mind just before the first book. She’s at a staff party for the radio station… basically stifling the urge to forgo the vegetable tray and have one of her co-workers for dinner. 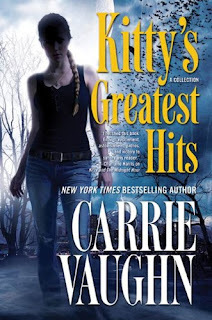 “Kitty and the Mosh Pit of the Damned” – It’s been about a year since Kitty took her talk show national, and she’s at a club to investigate a band whose every concert ends in violence. Is there something in the music making it happen? Is it the bandmembers themselves? Things go bad quickly when an audience-member is killed in the moshpit. It’s then, that the true source of the violence is revealed. “Kitty’s Zombie New Year” – Kitty is celebrating the new year at a party with her radio station crew, when a strange girl shows up at the door. Her eyes are dull; she’s unable to talk. Kitty realizes she must be a zombie… but how did she get that way? Zombies in Kitty’s world aren’t brain eating, walking carcasses. The girl is the victim of a selfish lover… and it’s damage that can never be undone. “Life is the Teacher” – Remember Emma? She was Alette’s living descendant who was turned into a vampire at the end of Kitty Goes to Washington. In this story, she is still coming to terms with what she has become and sets out to take blood from a human for the first time. She encounters a man from her old life and struggles with the rising monster inside her. It was a sensual story with a satisfying ending. “You’re on the Air” – We were introduced briefly to Jake in Kitty and the Silver Bullet. He was a vampire who called into Kitty’s show. He was made against his will and had no family. Now we get that phone call from his perspective… and we get to see what happens after he hangs up and decides to live his unlife with the cards that were dealt him. “Long Time Waiting” – This is the story most people will probably buy the book for. It details what happened to Cormac when he went to prison. Essentially, there is a demon killing inmates. And in the prison is the spirit of a demon hunter who knows how to defeat him. Amelia needs a human host to do the job and she thinks Cormac would be the perfect host. He fights the idea, but eventually gives in for the greater good. Here’s the thing: I hate the entire concept of Cormac sharing his body with this woman. Is she supposed to be an eventual love interest? The story reminds us of the unresolved feelings of Cormac for Kitty. Why does Carrie Vaughn torture me this way? Kitty and Cormac are like the dangling carrot I have been chasing for years. Kitty (and in a different way, Ben) is supposed to be the one who sees inside him… who has this bond with him… not some woman that’s been dead 100 years. It was a good story, but it just stirs up my angst all over again. Vaughn did provide some Author’s Notes at the end, which I did find insightful, answered a few of my questions, and added to the stories. The bottom line: I enjoyed the book as a whole. It reminded me why I liked the series… especially “Looking After Family,” “Wild Ride,” and “Il Est Ne.” Unfortunately, it also reminded me how frustrated I’ve become with the direction it has ultimately taken. 4 stars.